Zeolite is known for odor reducing capabilities in artificial turf. Zeolite is a negatively charged honey-combed molecular structure which absorbs liquid like a magnet and prevents ammonia from forming a gas which is the main cause of smell. It is one of the revolutionary upgrade to the artificial grass dog urine odor problems. 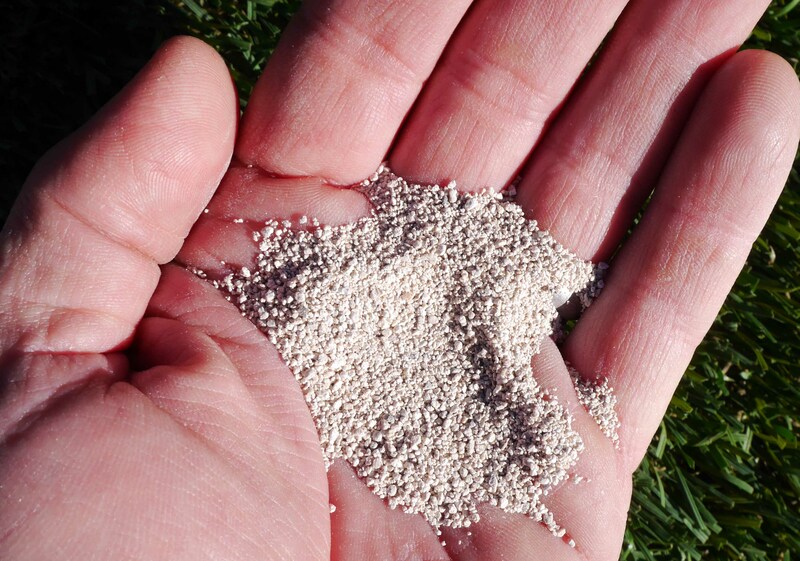 Zeolite has been used in synthetic turf since 2004 with positive and negative results. Positive Results: The zeolite used helped control the urine odors and cool turf fibers. Negative Results: The zeolite used had negative components which caused drainage issues and you had to use more pounds per square foot than the synthetic turf would allow. This brought the idea of using zeolite under the turf which brought more issues. When zeolite was placed under the turf, it didn't have the ability to absorb the urine and caused the urine gases to escape. Note: You may need to place zeolite under the turf when using a short pile turf because you can't put enough on top of the turf. There are limited zeolite brands which do not have these same negative results with purity levels high enough to work on the artificial grass as infill. More Negative Results: The smaller the granule, the more likely it will dissolve at a faster rate. Some zeolites are soft which dissipate quickly. Example of too small of a granule. All zeolites have their own specific DNA which is made out of volcano ash from the earth. Most volcano ash landed on top of mountain sides or desert landscape which mixed with chemical and biological components of the environment. Specific zeolites approved for artificial grass applications are made from volcano ash that has landed in water millions of years ago and has a purity of 97+ percent. This purity & absorption rate are the key components in the odor reducing productivity & drainage abilities of artificial turf. Although purity is a major factor, absorption is another key to choosing the correct zeolite for artificial grass. Choose a zeolite that changes color when wet. Zeolite is different than other infills because zeolite infill will absorb liquid & pulls any gases towards itself. It holds the gases until sodium ion (Na+) in rain water releases the magnetivity and the force of heavy rainfall will flush out the bacteria, forcing it through the turf into the ground. Other infills are solid and don't have the same abilities. What zeolites can I trust for my turf? 1. Purity rate of 97% or more. 3. Has no harmful elements (metals) which can destroy turf fibers. 4. Has a water retention absorption rate of 80% or more. 5. Does not contain sea shells. 6. Does not contain silica. 7. Is California Proposition 65 Safe. The zeolite must not have foreign specs of different colors. Pure zeolite is mostly one color. Some turf dealers change brand names of zeolite products. Don't trust zeolite packaged in brown paper bags with just a logo. Make sure your sales person knows where the zeolite is processed from. It is a costly mistake if you choose the wrong product. 1. Pure white zeolites found in New Mexico, Idaho & Texas contain sea shells which is made with calcium carbonate or chitin. When this calcium type zeolite breaks down due to hard rain, it causes the turf or any colored surface including concrete to turn white. The white calcium color is extremely hard to remove once it breaks down. Absorption Rate is low. Worst zeolite for artificial grass. 2. Pale green zeolites found in Colorado, Montana, and Idaho are made with ​Calcium, Molybdenum, Cobalt, Sodium, Chromium, Copper, Iron, Magnesium, Zinc, Manganese, and Chlorine. Although the green zeolite is pleasing in the turf, these hard elements contained with the zeolite can be harmful to the turf fibers. Not good for synthetic turf. Absorption Rate is low. 3. Light Tan zeolites only found in Death Valley, CA do not contain harmful hard elements like the others above and has a great absorption rate. This zeolite does not contain sea shells or crystalline silica. It has a high purity rate of 97%+ This is the premium zeolite which is perfect for artificial turf. 1. It is best not to water your turf from a garden hose when using zeolite for animal urine control because the hose water will be encapsulated in the zeolite granule not urine. Although you still can clean the area with hose water if your dog has an accident. Just keep in mind the zeolite will not hold urine until it dries again. 2. Any infill used in turf when dogs are present will have to be cleaned periodically. With zeolite applications an enzyme cleaner using a live liquid is best. Enzymes made from a powder will not be sufficient enough to clean the inside of the granule. How can I tell if an enzyme is made from a powder? Most powdered enzymes are milky in color. I you pour the enzyme in a clear container and let sit overnight, the powder residue will reside on the bottom of the container. "I used zeolite on my turf but it didn't do what they claimed!" "Thank you for enlightening me on the safest zeolite for artificial grass. I would have never known which zeolite to trust"
Which Zeolite Product Can I Trust? Why ZeoFill is the most popular zeolite for dog odor control. Rid odors from any surface with premium zeolite granules. Perfect for artificial grass.